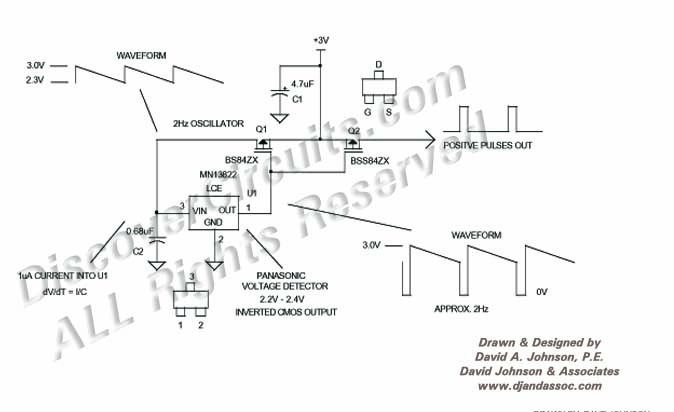 Circuit: CHEAP LOW POWER 3V 2Hz OSCILLATOR __ Circuit designed by David A. Johnson, P.E. This is yet another method to generate low frequency output pulses. The circuit uses an inexpensive under-voltage monitor IC and a couple of cheap MOSFETs. It could easily be modified to produce pulse frequencies from about one cycle per minute to a maximum of about 10KHz. It draws only about 1uA from a 3v battery. This circuit should not be used if frequency stability is important, since it will change as a function of supply voltage.